Hatters will be without winger Paddy McCourt for two games next month after he was called up by Northern Ireland for their Euro 2016 qualifiers against Greece and Finland. The winger has been in excellent form since his return to the starting XI, and gave another performance full of creativity and skill during the 3-1 win at Morecambe on Tuesday night. He will now miss the Johnstone’s Paint trip to Gillingham on Tuesday and Hatters’ home League Two clash with York City as Luton boss John Still said: “Congratulations to him for the call-up, it’s a blow to us as we’ll miss him for two game. “When we signed him, we knew the situation though and I think Luton supporters will enjoy watching him. McCourt’s improved fitness is shining through now as his prolonged influence on games is noticeable, setting up Jack Marriott’s last minute strike against AFC Wimbledon on Saturday. Still continued: “He’s getting fitter, that’s the key. He’s not as fit as we can get him as going away with Ireland last time he didn’t play, and they don’t train that hard as they’re preparing for games. 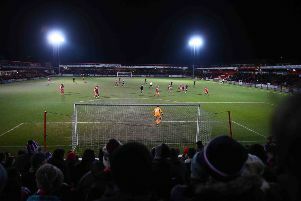 McCourt was involved heavily in two of Luton’s goals at the Globe Arena in midweek as his corner was headed home by Luke Wilkinson, before another mazy run and half-saved shot saw Cameron McGeehan hammer in front close range. McGeehan is relishing the chance to play with such a talented individual as he said: “I thought it was some of the best stuff we’ve played all season in the first half and the likes of Paddy McCourt was magic. “I think I’m gaining a good relationship now with Paddy on the pitch. He’s such a clever player, it’s great to have him here and working off him is getting goals and chances. Meanwhile, Wilkinson was also happy to watch McCourt work his tricks, adding: “You can see he’s quality, a very, very good player. “He gets things going for us and he’s a danger on the ball.